Under my administration, embassy websites will update at lightning speed, and all American flags will double in size. Mitt Romney created his most recent campaign shitstorm by launching an attack that was, simultaneously, an absurdly disingenuous argument built upon a series of demonstrable lies. 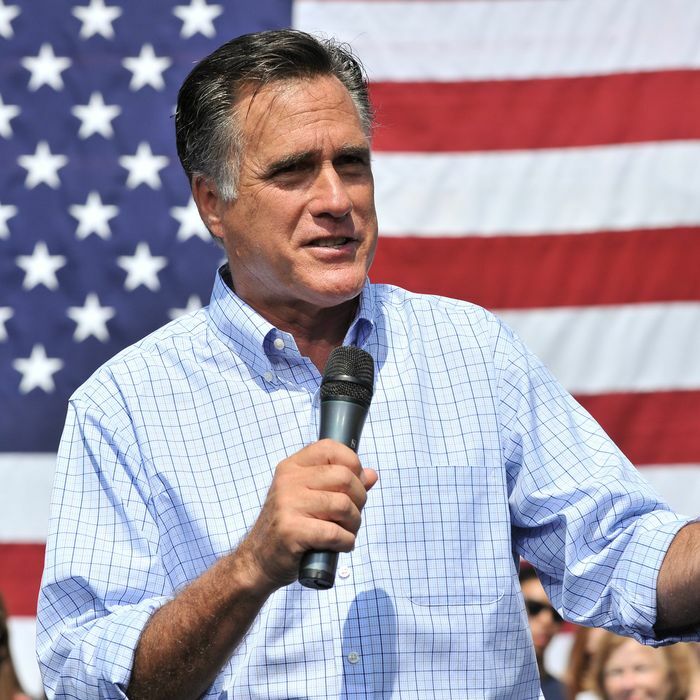 After an initial period of recrimination and lashing out at the media, Romney and his allies are insisting that he was absolutely correct all along. It is a remarkable testament to the party’s ability not just to engage in spin but create and sustain an alternate reality. On Monday night, Romney issued this condemnation of Obama: “It’s disgraceful that the Obama Administration’s first response was not to condemn attacks on our diplomatic missions, but to sympathize with those who waged the attacks.” The lies here are several: The statement was issued by an embassy staffer, not by Obama; It did not express sympathy with attackers; and it was not a “response” to the attacks but in fact preceded them. How is it an act of surrender for Obama to condemn a film but perfectly appropriate for Romney to do the same? What’s left of Romney’s position? What’s left is a desperate attempt to obscure the fact that Romney said a bunch of crazy and wrong stuff. Secretary of State Hillary Clinton released a three-sentence statement, the first two sentences of which addressed possible offense to Muslims. “The United States deplores any intentional effort to denigrate the religious beliefs of others,” Clinton said. “Our commitment to religious tolerance goes back to the very beginning of our nation. But let me be clear: There is never any justification for violent acts of this kind.” Clinton’s statement was: Regret, affirmation, condemnation, in that order. The first one reads primarily an argument that York’s claim is daft, while conceding that he is a decent fellow in other respects. The second is a way of conceding the ridiculousness of his argument while defending him against the charge of being a terrible reporter and a bad person. The old complaint about Romney was that he didn’t talk about foreign policy; the newly minted complaint about Romney was that he did talk about foreign policy. … If this isn’t the time to talk about this record, when is the right time? For the press, politics doesn’t stop at the water’s edge. It stops wherever is most convenient for Obama’s reelection campaign. Yeah, that’ll show those nasty reporters arguing that Romney is not allowed to criticize any aspect of Obama’s foreign policy. Likewise, what’s the deal with everybody getting furious with James Holmes for going to the movies? Lots of people go to the movies! MITT ROMNEY: Well, early on, with the developments in Egypt, the embassy there put out a statement which stayed up on their website for, I think, 14-15 hours. GEORGE STEPHANOPOULOS: But before the protestors had breached the wall. MITT ROMNEY: Well, it first went up before they breached the wall. But it stayed up. And they reiterated the statement after they breached the wall, even after some of the tragedy in Libya, the statement stayed up. So the proof that Obama “sympathizes” with people who attacked the U.S. embassy is that, the in the wake of the attacks, the embassy staff didn’t take down a statement attempting to preempt the attacks from its website quickly enough. Under a Romney administration, embassies under siege will update their anodyne website statements within seconds, even if they may be distracted with such tasks as not getting murdered by violent mobs. Indeed, Romney believes that the increase in website-statement-updating he will usher in is important enough to justify his larger claim that he Stands Tall against our enemies while Obama apologizes to them.